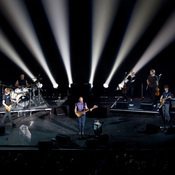 "Last time Sting played South Florida, in July 2010 at the Cruzan Amphitheatre in West Palm Beach, he was backed by the 50-piece Royal Philharmonic Concert Orchestra, and it was great. No, it was breathtakingly magnificent, actually. But on Saturday night at a sold-out Fillmore Miami Beach, the frontman for The Police proved he's just as mesmerizing with a mere five-piece backing band.Clad humbly in a tight gray T and jeans - and hair cropped so close he was nearly bald - Sting (on bass, for a welcome change) started the night with the country-tinged 'All This Time', powered by acoustic guitar, mandolin, and sultry backup singer Jo Lawry. The crowd then exploded when the band kicked into 'Every Little Thing She Does Is Magic', during which Sting - who recently turned 60, but looks more like 40 - absolutely nailed every high note. And the band didn't miss the keyboards from the studio version one bit..."
Click here to read in full what the Miami Herald had to say about Sting's concert at the Fillmore Miami Beach. Were you there? Share your review or comments and post any photos from the evening or your ticket stub to the event page. Tell us about it! Sting.com member exclusive: We're excited to bring you a new video in which Sting discusses the members of the Back To Bass band! Sting.com Member Exclusive: On Monday, November 14 at 8:30PM, join renowned music journalist Anthony DeCurtis and Sting as they explore his indelible solo career, including his most recent release, Sting: 25 Years, the definitive box set collection, his current Back to Bass tour, and the announcement of an exciting new project! This event will take place on Manhattan's Upper West Side, with further details to be posted here on Monday morning.